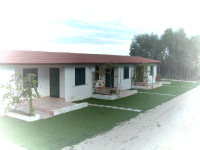 Deligios's holiday farm was born in 1996 from a recover and repair project of an old building situated on our farm house. We start repairing in late 1996 and in 1997 we were glad to welcome the first customers. In 2000, we decided to extend our offers with a new building, bringing to eight the number of apartment. Our main activities are still farming and breeding. Every year we grow about 100 acres with cereals and forage for livestock. Sheeps and goats let us to produce milk, used to obtain dairy products like the worldwide known "pecorino sardo". Our customers, during holidays, will taste some of the most famous sardinian foods and drinks. Design by Giovanni Ortu. Photos and pictures are free and under Creative commons license.